I think this may be my final Etsy shop review for a while! I haven’t bought any stickers yet in 2019! I’m having a bit of a drive to reduce the amount of planner supplies (and possessions in general) so unless I stumble across a new shop I want to try, I won’t be purchasing any stickers for a while. 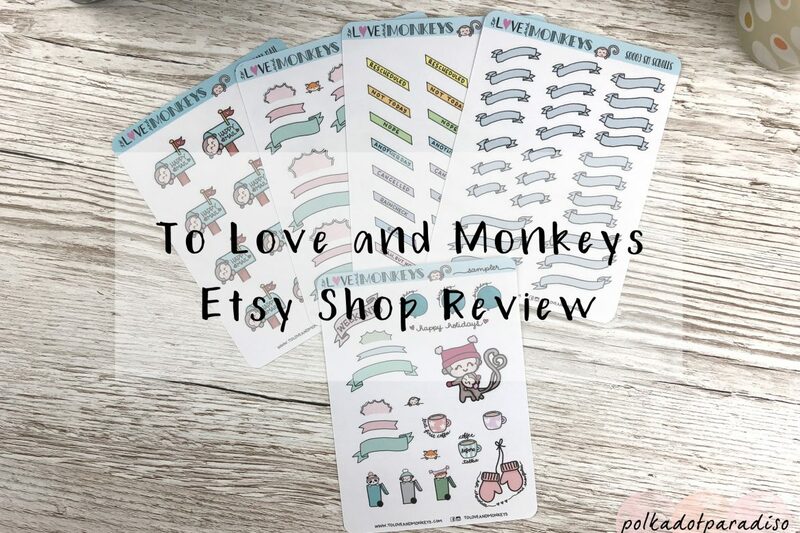 One of my last purchases was from a new shop, To Love and Monkeys*. I took advantage of a sale and picked up a few sheets. The main thing I wanted was the cancelled stickers. I don’t have any that fit the columns of the Hobonichi Cousin. At last I do! I should get on and create my own for the shop, but I couldn’t resist these. I seem to collect happy mail stickers and so I had to pick up these cute little post box monkeys*. I’m also lacking in empty flags and banners that fit in my Hobonichi so I got a couple of these sheets*. They’ve come in really handy for titles and headers in both my weekly and daily pages in the Cousin. They’re made from paper sticker sheets and so most pens work on them apart from fountain pens. The stickers are well cut with nothing miscut. My order came with a generously sized sampler (as in the seen in the main picture above). The designs are cute and I’ve enjoyed using them in my planner. At full price these sheets are £3 each which is a little more than I would normally pay for such sized sheets. There was a sale on when I purchased though, with 25% off and free shipping. Have you purchased from any new sticker shops lately? Let me know in the comments below!